Samsung Galaxy S10 is one of the most-awaited phones now. And, we have heard all sorts of rumors when it comes to the Galaxy S10 screen. A new rumor now hints of something that many hate to see on the phone. Yes, you got it, it’s the notch. But, that’s not all, as per the rumor the S10 would have a strange notch. Is Galaxy S10 screen getting a notch? This new rumor comes courtesy of an image by a Vietnamese Facebook user. 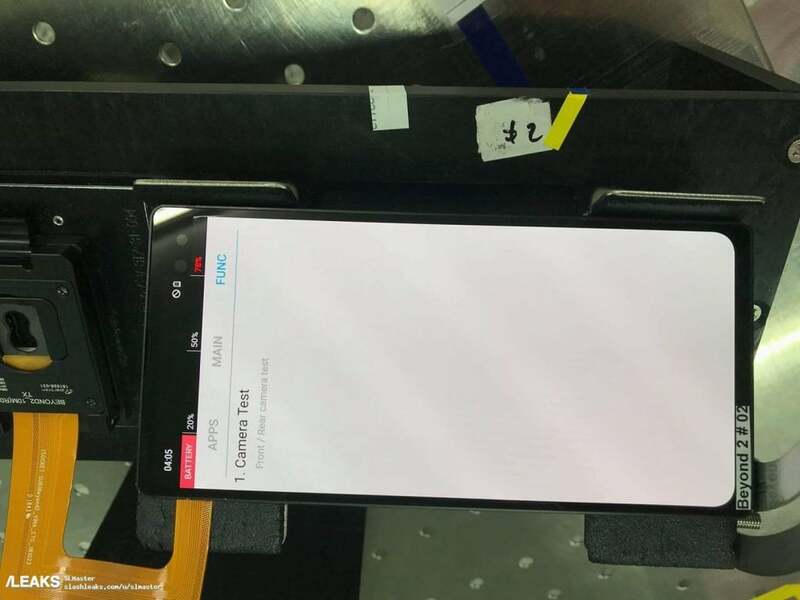 The image is not of the S10, rather the S10 Plus prototype (with a codename “Beyond2”), and reveals a heavily disguised corner notch. Further, the image reveals two front cameras – possibly for standard and wide-angle shots. The two camera setup is in line with some of the earlier leaks of the S10. Also, it is not the first time we are hearing of this strange notch on the Galaxy S10 screen. A recent Weibo post showed screen protectors with a similar strange setup. Though the post does not say it is for the S10, the internet was quick to guess that it is for Samsung’s upcoming phone. Also, the images of the strange notched phone first appeared from Qualcomm’s Tech Summit in Hawaii. But, the images were believed to be of the 5G prototype. Notches have mostly been criticized for eating away a part of the screen. But, those in favor say that it helps to expand the screen. This latest leak backs the “Infinity O” design, which was revealed at the Samsung Developer Conference last month. The Infinity O design, if you don’t know, has a circular cut out in the display. A circular cutout is seen as an alternative to the notch. So, the Galaxy S10 screen would have camera holes on the top right hand corner, rather than the notch, which usually extends from the top. But, the setting of the two in-display front cameras would be such that it will appear like a small notch on the right side of the screen. So, it can be said that even though the leaked image appears to show a hole, it does remind of a corner-notch design. The latest leaked image does not appear to be the final design considering the heavy machines we see all around it. Also, Samsung is known to change the design at the last moment, like it did with the Galaxy Tab 10.1 to compete with the iPad 2. Nevertheless, the string of leaks of the S10 does suggest the efforts that Samsung is making to come up with a perfect phone, which it needs badly. All such leaks, however, must be taken with a pinch of salt until Samsung announces anything officially. Also, one must remember that the latest leaked image is of the S10 Plus, and whether or not it would make its way to the standard model is also a question. Galaxy S10 – what to expect? A separate leak last week showed the Galaxy S10 screen with just one front camera. This leak (via Forbes) suggests the S10 with extremely thin bezels around the entire display. Further, the leak shows a display hole in the top-right corner for the front camera. On the rear, the leaked image shows a horizontal camera, similar to the one seen on the earlier Note series handsets. However, unlike the current Note 9 with two rear cameras, the S10 would feature three cameras. The three rear cameras would be the primary 12MP sensor, a 13MP telephoto camera, and a third 16MP with a wide-angle lens. It must be noted that a recently leaked video of the larger Galaxy S10+ showed a device with four cameras. Further, the plus variant is shown to feature a 6.4-inch display, while the regular variant gets a 6.1-inch display. Talking of other expected features, the case renders suggest a power key, a dedicated Bixby button and a volume rocker along the S10’s aluminum frame. Further, the handset is expected to get a bottom-firing speaker and a USB Type-C port. The handset would be powered by Qualcomm’s Snapdragon 855 or Samsung’s Exynos 9820. The S10 would come with 6GB RAM and 128GB internal storage. It would run on Android 9 Pie with One UI on the top. Battery capacity of the handset remains unclear for now. Samsung is expected to announce the Galaxy S10 in late February at MWC 2019.